Traveltura.com Ltd T/A Traveltura.com would like to state that the protection of our customers privacy and personal data is our highest priority.Privacy and personal data protection are some of the most important aspects of our work. The way we create , organize and implement our activities both on-line and off-line are based on privacy and personal data protection. Besides the personal data entered by any user voluntarily into our respective on-line forms, Traveltura.com Ltd T/A Traveltura.com does not collect personally identifiable information from the visitors on its websites. The data provided by you will be used only by Traveltura.com Ltd T/A Traveltura.com staff and only for the required purpose and will be kept for statistical and historical reasons for the period of 6 months. Credit card details are destroyed after the booking procedure is finalized. Such information will not be posted or published by us, and, except for the booking procedure which requires a disclosure of relevant data to the respective partner accommodation provider, it will not be provided to any third party or used for any commercial goals. We at Traveltura.com Ltd T/A Traveltura.com do not gather personal data from visitors of our websites by using cookie technology. Only in certain occasions we collect some statistical data for the future improvement of our websites. This data is collected only for statistical reasons and can in no way identify the visitor. 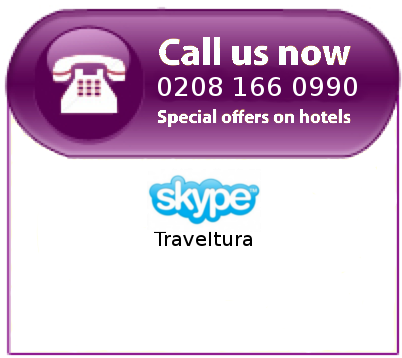 If you have questions about Traveltura.com Ltd T/A Traveltura.com or its services, visit our contact page to find our telephone numbers and an e-mail contact form. All of the content on the websites of Traveltura.com Ltd T/A Traveltura.com is copyrighted by Traveltura.com Ltd; registered in England and Wales; Company No.4276398 VAT: 810 5718 51 with Head office at: 3 Littlestone Road, New Romney, Kent, England, TN28 8LN. It cannot be redistributed or used for commercial purposes. Traveltura.com Ltd T/A Traveltura.com cannot be held responsible for the contents of any pages referenced by an external link.